We mourn the loss of two of our longtime members, Karen Pratt, Nu, and Jonna McKendree Merritt, Nu. Karen, who died May 7, 2015, was a charter member and our first secretary. She kept the most exact, professional minutes that could ever be taken. Karen's was very proud of her brothers and their families. She was a wonderful friend and has a special love of animals. As is our tradition, $50 was contributed to the Tri Sigma Foundation in memory of each of these women. 2013-14 Volunteer of the Year! 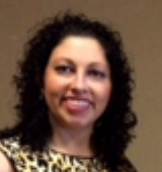 KCAC President Ashley Adorante, Alpha Gamma, was named FHSU Alumni Association 2013-14 Volunteer of the Year! Congratulations, Ashley. Class of '64 members from left: Brenda Porter Dumler, Donna Jones Clark, Carolyn Granger Austin, Carol Crank Phillips, Barbara Smith Thompson and Carole Ruf Gurley became members of the UCM 50 Year Society over the weekend of May 9-10. The weekend ended with five of the women participating in the graduation ceremony. 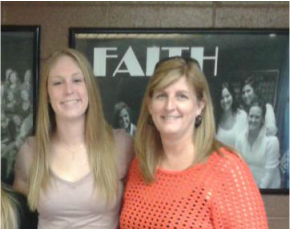 4/27/2014 Erica Doane, Nu, who is the daughter of Julie Shuck Doane, Nu, received the Margaret Freeman Everett Outstanding Senior Award. 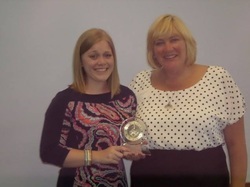 It was presented to her by National President Kaye Schendel. Erica will be working for the National Tri Sigma Organization as a Regional Consultant following graduation. 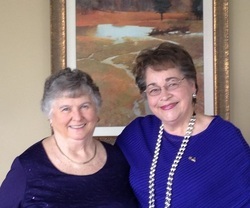 4/27/2014 Jonna McKendre Merritt, Nu, received her Golden Violet Award from National President Kaye Schendel at Nu Chapter's Founders' Day celebration. 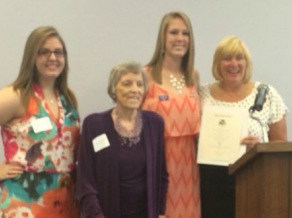 Jonna has a daughter, Julie Merritt Kelly, and two granddaughters, Katie and Allison, who are also Nu Chapter members. 4/12/2014 $50 and 150 pairs of socks were collected this spring for Blair's Foster Socks. 2013 Lindsay Spiek, ZT, who works for Dominion Dealer Solutions, won awards for selling over 1 million dollars in new revenue and for being #1 in new accounts this year!! Congratulations, Lindsay. 11/9/13 Ashley Adorante, AG, and Lindsay Spiek, ZT, received the Circle Degree at the Brunch Meeting, Saturday, November 9, 2013. Pictured from left, President Frankie Ritter Wainwright, K, and Circle Degree recipients Lindsay and Ashley. For more photos, see Photos section. Vicki Wellman Bird, Nu, was named the Outstanding Advisor in Region 4 . The Nu Chapter Advisory board which includes Vicki, Melinda Dunard Horn, Nu, Julie Shuck Doan, Nu, and Terry Strobel Jackson, Nu, were named Chapter Advisory Board of the Year. Nu chapter won the award for Member Development and Educational Programming as well as winning 1st place overall in Greek Week. 2012-2013 Frankie Wainwright, Kappa, was named Advisor of the Year at Missouri Western where she is the Chapter Advisor of Zeta Tau chapter. 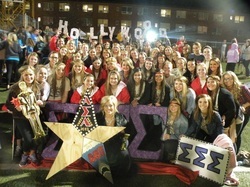 She is pictured here with the Zeta Tau's who won first place at Greek Week. 4/2013 Matt Ruesler and Sydney Wittmeyer, Mu, were married on April 13, 2013. Our congratulations and best wishes to both of them. 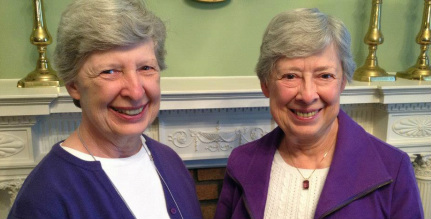 4/13/13 Barbara Smith Thompson, Nu, and Carole Ruf Gurley, Nu, were presented with their Golden Violet awards at Founders' Day. Our president, Frankie Ritter Wainwright, Kappa, attended the Golden Violet Retreat which was held at Walton House in Woodstock, VA. 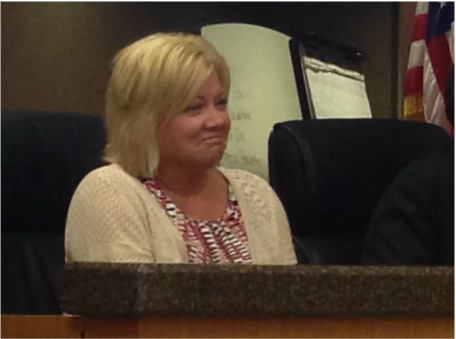 Her sister, Linda Ritter, Kappa, who lives in Ohio also attended. Linda, who was eligible for the award and had never received it, was given the Golden Violet Award at the retreat. Linda was president of Kappa chapter when Frankie pledged. 2012 Recruitment includes several new Sigma Pledges with ties to our alumnae family. McKendree Merritt, as Sigmas at UCM. 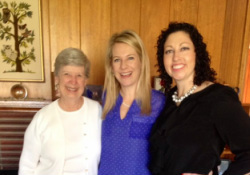 Three generations of Sigmas. WOW!! also a Sigma at Truman and is president of the chapter. Three Sigmas in the family. Another WOW! followed her mother and her sister Erica by pledging NU chapter. Erica is vice-president of the chapter. Three Sigmas in the family. Another WOW! Judy Jones Wells, Nu, and Frankie Ritter Wainwright, Kappa.